​The Lakeside Saddle & Driving Club was established in 1981 by Duane and Joan Pillsbury because of the need for a safe multi-use community equine facility in the Lakeside area. It is located in the beautiful Lakeside river valley surrounded by foothills and mountains, just a couple of blocks off highway 67. With increasing traffic and few public access equine facilities, the club was planned and developed to accommodate all types of equine activities for its members, including roping, dressage, jumping, driving, reining, cutting, pleasure riding, and trail riding. 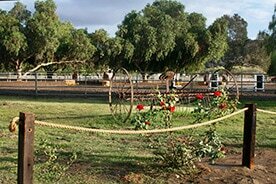 The facility has numerous arenas, cattle pens, a large round pen, a dressage arena, a regulation driving dressage arena, two lunge pens, a mile riding track, two wash racks, a picnic area with tables, benches, a barbeque, and bathrooms. Lights in the largest arena provide the opportunity to ride after dark.. The sandy soil provides good footing and drainage. 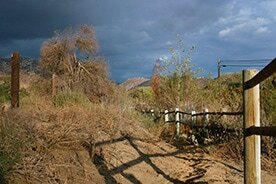 There is direct access to the San Diego River trails that run for miles up the El Monte Valley. For rules and membership levels download, print, complete and return ​ our Riding Club Info and Application (pdf). Membership in the Lakeside Saddle & Driving Club has many benefits. 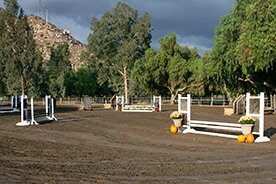 You'll enjoy our well-maintained arenas, easy access and a warmly welcoming equestrian community. Individual and family memberships are available for a reasonable annual fee which covers maintenance. The cost has been kept as low as possible and members are encouraged to keep the facility clean and safe to alleviate increasing the membership fees. Join us!